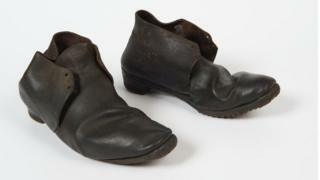 A growing number of old shoes have been discovered concealed inside the walls of British homes. The peculiar practice, which was thought to have been carried out by superstitious builders and homeowners, was intended to help protect the buildings from evil spirits. One such example was discovered by Laura Potts - a homeowner who was undertaking renovation work at her Georgian home near Norwich when she came across a woman's shoe in the wall. According to History professor Malcolm Gaskill, it had probably been left there to deter 'witches'. Fear of these supernatural beings was rampant throughout the 18th and 19th centuries. "One theory proposes that the shoes were intended to act as lures for witches, spirits, and other supernatural threats," said historian Ceri Houlbrook from the University of Hertfordshire. "The theory is that the evil force believes the shoe to be the person, attacks the shoe instead, and becomes trapped inside it."